3-1/2" x 1-1/4" Swivel Caster | Phenolic Wheel | 350 lbs Capacity | Plate Size: 3-1/8" x 4-1/8"
Phenolic resin wheels are mixed with phenolic resin with macerated canvas and other compressed materials; These wheels are molded under high pressure and temperature. Phenolic caster wheels are recommended for smooth concrete floors and can be used for storage loads without permanent compression set to the wheel. These phenolic wheels are highly resistant to oil, grease, gasoline and mild acids. 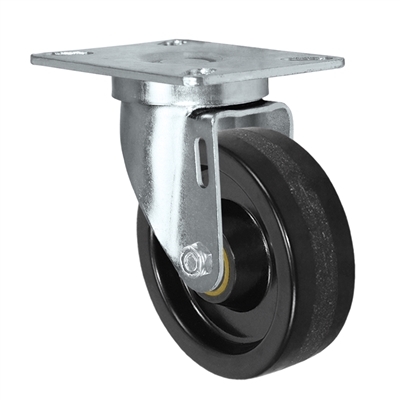 Phenolic caster wheels will carry loads as great as the same size Gray Iron Wheel Casters. The wheel tread may show wear from repeated travel over rough floor surfaces. Phenolic Wheel Casters are one of the most commonly used casters due to the inexpensive costs and high weight capacities and durability these type of wheels offer. If your looking for a true heavy duty caster that wont break the budget buy phenolic wheel casters from CasterHQ. Phenolic Casters can be used in many industries and applications due to the durability and strength. These wheels can hold large amounts of weight, will not tear up concrete floors and will not flat spot. Phenolic wheels perform best on smooth surfaces due to the wheels hardness. Phenolic wheels do not perform well on un-even floors with chipped concrete or obstacles in the wheels path. Phenolic Wheels should NOT be exposed to water. The material of phenolic wheels will eventually swell and the wheel could fall apart over time if exposed to water. These should be used in clean, dry environments such as warehouses, garages, buildings, retail stores, and anywhere that has clean, dry floors. I would not recommend Phenolic floors on custom wood floors as these could leave slight indentions if the weight of the cart is too heavy since real hardwood is a naturally softer and expensive floor type. If you need replacement phenolic wheels only please Click Here. •	Phenolic resin mixed with macerated canvas; creates a high capacity, high impact resistant wheel that has many years of proven reliability in the industry. •	Hard tread rolls easily, provides good concrete floor protection and is quieter than steel wheels. •	Resistant to oil, grease & solvents, non-metallic & non-sparking. •	Zerk fitting are not standard, but available upon request. •	Durometer: 90 Shore D (+/-5). 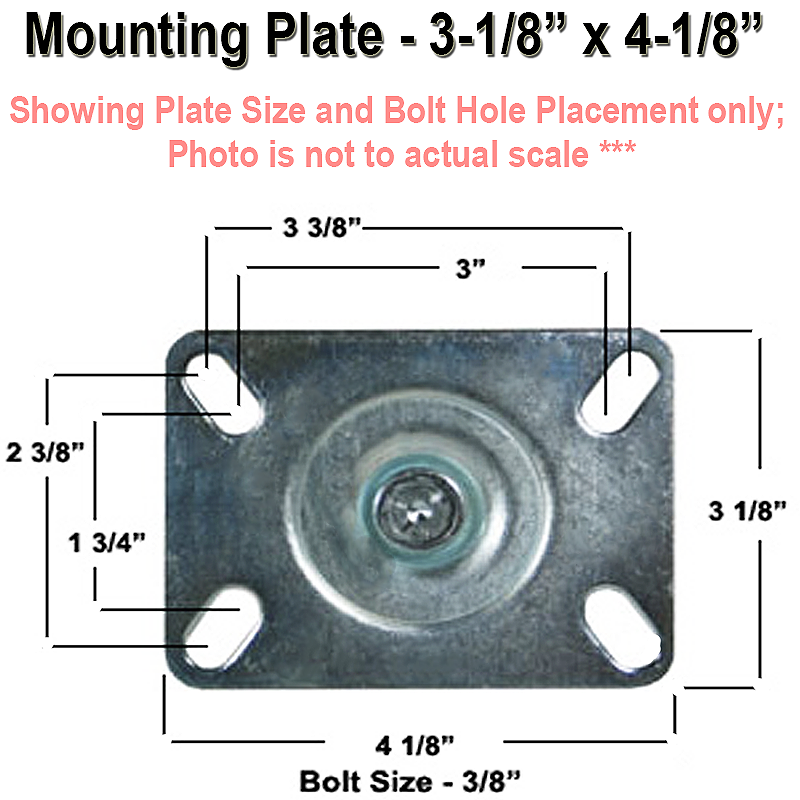 •	Temperature range: -50° F to 250° F.
Mounting Plate Size: 3-1/8" x 4-1/8"
Bolt Hole Pattern: 1-3/4" x 2-15/16" slotted to 2-3/8" x 3-3/8"
4" x 1-1/4" Rigid Caster | Phenolic Wheel | 350 lbs Capacity | Plate Size: 3-1/8" x 4-1/8" 4" x 1-1/4" Swivel Caster | Blue Polyurethane on Polyolefin Core Wheel | 300 lbs Capacity | Plate Size: 3-1/8" x 4-1/8" 4" x 1-1/4" Rigid Caster | Red Polyurethane on Polyolefin Core Wheel | 300 lbs Capacity | Plate Size: 3-1/8" x 4-1/8" 3" x 1-1/4" Rigid Caster | Polyolefin Wheel | 250 lbs Capacity | Plate Size: 3-1/8" x 4-1/8"
3-1/2" x 1-1/4" Swivel Caster | Blue Polyurethane on Polyolefin Core Wheel | 275 lbs Capacity | Plate Size: 3-1/8" x 4-1/8" 3" x 1-1/4" Swivel Caster | Red Polyurethane on Polyolefin Core Wheel | 250 lbs Capacity | Plate Size: 3-1/8" x 4-1/8" 5" x 1-1/4" Swivel Caster | Polyolefin Wheel | 325 lbs Capacity | Plate Size: 3-1/8" x 4-1/8" 4" x 1-1/4" Rigid Caster | Blue Polyurethane on Polyolefin Core Wheel | 300 lbs Capacity | Plate Size: 3-1/8" x 4-1/8"
PLATE CASTERS > Capacity up to 350 lbs: - 3" thru 5" Wheels - Plate Size: 3/1/8" x 4-1/8"